As the top provider of used network equipment and reseller of new hardware, Hula Networks is positioned to offer best of breed solutions without the influence of any one OEM. We Provide both new and used network equipment along with the highest level of service. Hula Networks is a provider of used and refurbished Cisco Hardware including routers, switches and accessories. We also carry an array of storage devices including EMC, NetApp, Dell EqualLogic and HP. If you are looking for networking equipment, you've come to the right place! 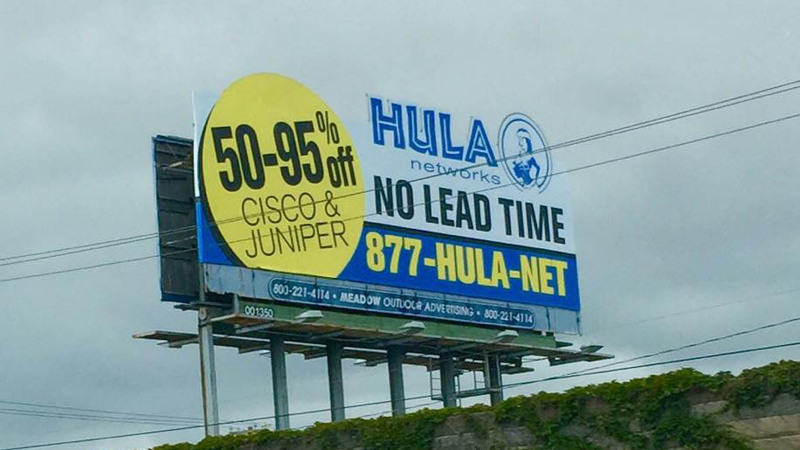 Hula Networks carries over $20 million in inventory of used routers and computer network hardware including the full line of pre-owned, refurbished Cisco & Juniper routers, Extreme Switches, Foundry Networks, Ixia, and Smartbits. Our extensive Cisco inventory includes Cisco routers, Catalyst switches, Access Servers, Cisco security products. (PIX, VPN and IDS), Cisco IP Telephony and VOIP products, Content severs, all Cisco memory, modules, and accessories. All Hula Networks pre-owned equipment is backed by Hula Networks Standard Warranty with Cisco Certified technicians available as needed. Both one and two year extended warranties are available on all pre-owned network equipment. People are discovering the great economic value in pre-owned network equipment yet at the same time, may also require equipment with cutting-edge specifications for certain applications. As a new and used equipment reseller, Hula Networks offers the best of both worlds providing you the highest level of certification and performance available, along with the lowest total cost of ownership.